Click chart for premarket data. Once again, the fiscal cliff negotiations in Washington will take center stage for investors. 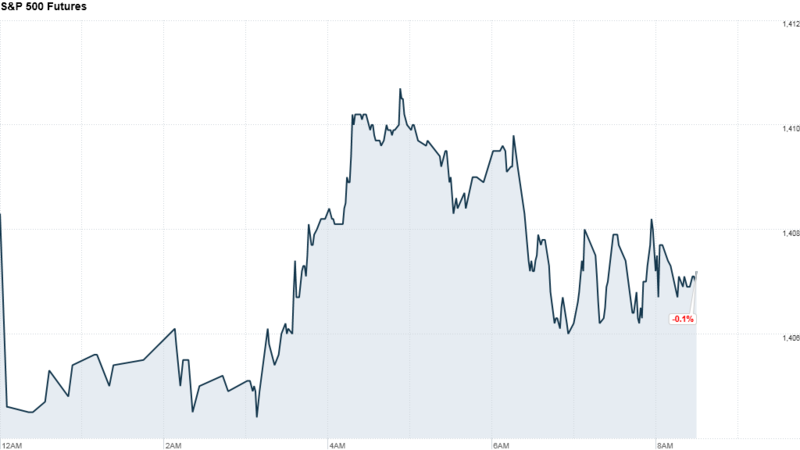 U.S. stock futures were little changed Thursday, after markets finished mostly higher Wednesday. The government's latest jobless claims data came out before the opening bell. The Labor Department reported that the number of Americans filing for first-time unemployment insurance dropped 25,000 to 370,000 last week. Meanwhile, the fiscal cliff continues to keep investors on edge. President Obama told members of the Business Roundtable Wednesday that there has been "some movement" on the Republican side toward allowing rates to rise on high-income taxpayers. If this continues, he said, "we can probably solve this in about a week." Obama was adamant that going over the fiscal cliff for political purposes would harm the economy by jeopardizing America's credit rating. In corporate news Thursday, lululemon athletica (LULU) reported third-quarter earnings that topped expectations, but its guidance for the fourth quarter fell short of forecasts. Shares of the athletic clothing maker slid more than 2% in premarket trading. European markets were up in morning trading, with Nokia leading the way after China Mobile agreed to sell the Finnish company's Lumia 920 handset. The European Central Bank announced Thursday morning that it will leave rates unchanged. But investors will be listening to comments from ECB head Mario Draghi at a press conference following the decision for any hint of a cut in rates next year. Asian markets ended mixed, showing little unified movement as Japan's Nikkei got a boost from a weakening yen and new polls ahead of Election Day.